Villa Tranquilla lives up to its' name. our villa is set well back from the main road. There is almost no passing traffic; there are no planes passing nearby and the closest railway is 50km away. When you arrive at our pristine apartments, just unpack, pour yourselves a complimentary glass of cava and start to relax. We can even go shopping for you in advance of your arrival so you won't need to enter a supermarket for a few days ! The villa is set in a half acre site, mainly lawns and flower beds with lots of terraces and an 8 metre pool that can be heated Oct 1 - Apr 30. All apartments have breath-taking sea views and face south/south-west so lots of sunshine. There are books to read, DVDs & videos to watch as well as a limited choice of English channels or German/Spanish/French/Arabic satellite channels. The "Pool Apartment" is just by the pool (no surprise there !) and comprises a very spacious bedroom with king-size bed (possible to divide it), lots of wardrobe space, dressing table, study desk, 2nd TV with inbuilt VHS player and door to shower room/WC. The living room has an 'L' shaped leather sofa, TV/DVD & satellite box. Dining table with 4 chairs, open plan fully equipped kitchen, large sliding picture window to covered terrace with wrought-iron table & chairs, perfect for Al-fresco eating. Wonderful garden/pool/sea views from here. We also live in the villa and provide a concierge service. If required, we can advise places to visit, a variety of restaurants, book taxis & meals etc. The two other apartments in the villa are both 2 bed 2 bath. (Palm Terrace & Fountain) You will see them on this site. We chose to come & live our new life in Estepona over 10 years ago and so far, have not regretted that decision. For our business to work, we knew we required a wonderful sea view; it had to be close to civilisation; not in a typically touristy area like Benidorm or Fuengirola; a quiet position away from traffic etc. Airport(s) had to be reasonably close and there had to be lots of places of interest. We found Estepona & Villa T. ticked all of the boxes. We hope it ticks yours. Half acre garden mainly lawn and used by our 3 apartments only. Table-tennis; wi-fi; 450-film VHS/DVD library; concierge service are all free. Pool is heated (optional) 1 Oct - 30 April @ 65e / week / apartment. Range of popular cds & English / German books. Bed is King-size, but can be divided. 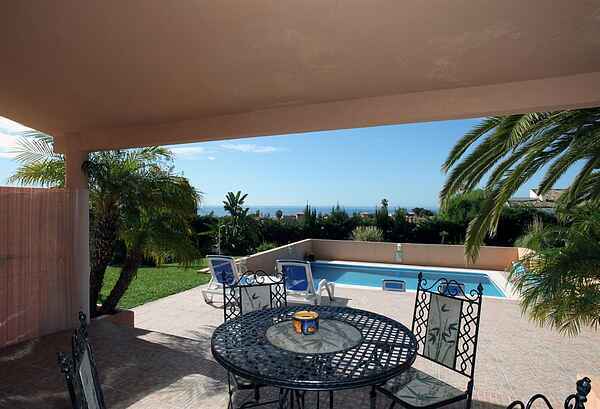 Very peaceful location, but only a 6 minute drive to Estepona Port.